For the past four years the White Rock Traditional Jazz Society has sponsored a "Youth Jazz" camp for schools from grade 8 through grade 12. This year's program will be for university/college students studying music for a bachelor's degree. Alan Matheson has been teaching jazz to young college and university students for over 30 years and is one of the best traditional jazz trumpeters and pianists in Vancouver. He has performed at a number of jazz festivals in North America and Europe and has appeared many times over the last 20 years at our jazz club. It is our privilege and honor to give his name to this competition, with the hope it will become an important date in the University and College calendar for many years to come. 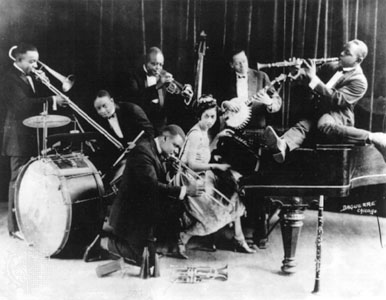 Traditional jazz is the music made famous by Louis Armstrong, Jelly Roll Morton, and King Oliver in the 1920s. Our jazz club has been playing this style of jazz every Sunday afternoon for 27 years. We are always seeking out new young bands and musicians to continue to play our type of music for many years to come. There will be a workshop included in this event where students will be taught the finer points of trad jazz by some of Vancouver's finest pro jazz musicians, who form our faculty.